A STAR TREK Fan Film Round-Up | Warped Factor - Words in the Key of Geek. Matthew Kresal rounds-up some of the more interesting Star Trek fan films available. I recently reviewed the Star Trek fan film Horizon and, in the opening lines of that review, I commented on the renaissance in fan films that's taken place in the last decade or so. While Horizon is a stand out, it certainly isn't alone so this article aims to present just some of the Trek based fan films out there. It is by no means an exhaustive or 'best of' list but one that will hopefully entice you to check out what's out there. This series is really the father of the current era of Trek fan films. New Voyages (briefly retitled Phase II after the canceled Star Trek revival TV series) was the first high profile fan film series featuring excellent recreation of the Original Series sets and costumes as well as drawing on talents involved in some of Trek's official incarnations, both in front of and behind the camera. Being there first though means that its early episodes are very rough around the edges in terms of production values and acting, but the series has improved over time. Yet its most famous episode might be one of its earliest, World Enough And Time, which not only featured George Takei returning to the role of Sulu but was also nominated for a Hugo Award in 2008. 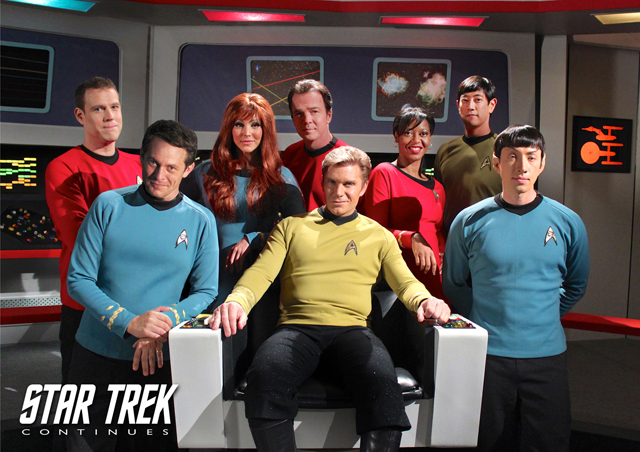 In a similar vein to New Voyages is Star Trek Continues. Lacking the rough edges of New Voyages earliest episodes, Continues may well be the best Star Trek fan film series out there at the moment. Working to bridge the gap between the end of the Original Series and Star Trek: The Motion Picture, the series features stunning recreations of Original Series sets and costumes as well as strong production values and performances. The series also features strong, character focused writing which has allowed for both socially conscious episodes in the finest Trek tradition as well as character exploring episodes. To date seven episodes have been released with the most notable perhaps being a sequel to Mirror, Mirror entitled Fairest Of Them All. Another of the more interesting fan films out there at the moment is Renegades. Set ten years after the end of Voyager as the Federation comes under threat, Renegades reunites a number of Trek alumni including Tim Russ, Robert Picardo and Walter Koenig as well as other genre actors including Sean Young, Richard Herd and Corin Nemec. Though it has rough moments, the performances and special effects do carry it a long way, making it intriguing viewing and something quite different from many of the Trek fan films out there. The Original Series era has been a popular place to set fan films as the next couple prove. Secret Voyages is set just after the end of Kirk's five year voyage, the series details a secret Starfleet mission on which the Enterprise is dispatched under a new crew. While over-reliant on green screen for some of its sets and featuring variable performances, Secret Voyage has an interesting premise and showed plenty of promise though it sadly lasted only two episodes (the first of which is above). While not set on the TOS Enterprise, Farragut takes places on her sister ship and has crossed over with New Voyages. Farragut can also lay claim to being one of the longest running series with its first episode having been released back in 2005. It has steadily improved over time in terms of production values and has even had animated episodes released. Its final episode Homecoming will be released later this year if all goes according to plan. As the fan film Horizon showed, the Enterprise era and the Romulan War can be fertile ground for Star Trek storytelling. The long running Romulan Wars series takes another look at this pivotal but largely unseen conflict with two seasons, each focusing on a different ship. While perhaps unpolished like some of the other films on this list, the two seasons present an intriguing viewing of the conflict with nice tie-ins to both Enterprise and the Original Series. Speaking of Enterprise, one of the more interesting Trek fan films out there at the moment is this German stop motion offering. The crew of the NX-01 do battle with the Red Empire, a cybernetic race who threaten the course of history. As a stop motion film, The Beginning of the End is an impressive piece of work and the choice of medium makes it stand out from the pack. A rarity among Trek fan films are those set in the reboot universe of the current film series. An exception to that is Chasing The Infinite Sky which, at a little under five and a half minutes, is the shortest film on this list. More of a special effects reel than anything else, it's a visually compelling piece of work showing off some excellent shots of the reboot universe starship the Albatross on a mission testing a new engine. Though it features little in terms of either performances or proper storytelling, it does show off the kind of special effects fan films are capable of presenting. No list of Trek fan films would be complete without mentioning Axanar, the source of a large controversy in the Trek community at the moment due to an ongoing lawsuit regarding it. It can be difficult at times to separate this twenty-one minute short film from that lawsuit, but if you can do that, it is something to behold. Presented like a documentary, Prelude To Axanar tells the story of the Four Year War between the Federation and the Klingons and features a number of those involved with the conflict (including Garth of Ixar from Original Series episode Whom Gods Destory) being interviewed. Not only that but the quality of its special effects are strong, strong enough to easily rival the best of official Trek incarnations. Given the lawsuit it might be all we ever see of Axanar but, if it is, it's a fine piece of work to say the least. Once again, this is just a sampling of some of the Trek fan films out there. Have a favorite that I've missed? Comment below because I'd love to see them.